Most investors try to forecast the future. We first learn from the past. Fund-administrator lists on the ASX, and Forager takes a stake. Boards need to think about franking credits when fielding a bid. Rolls Royce is in a funk. We smell opportunity. I started the year on skis and ended it on crutches, but it wasn’t all downhill in 2015. In fact, it was a good year for both Forager funds and the business. This calendar year was a treacherous one, with a number of high profile disasters catching investors unaware and a global commodity bear market turning into an out and out rout. Combined with the ups and downs of our own small investing world, this provided the backdrop for plenty more deposits in the Forager knowledge bank. I asked the team to share a few of their own lessons from the past year and have summarised their thoughts into the following six lessons. The mistake that cost you money this year – particularly if you are invested in the Forager International Shares Fund – was our assumption that oil prices would remain around $100, or potentially rise from there. Our investments in oil services stocks were belted in late 2014 and belted again in 2015, partially offsetting some excellent results elsewhere in the portfolio. There are a few lessons here. The first, as our Americas analyst Kevin Rose points out, is that the market is highly sensitive to what we would previously have considered relatively small changes in supply and demand. “We didn’t appreciate that oversupply of 2-3% could send the oil price plummeting 70%”. We discussed the impact of US shale supply in depth before investing in the oil-exposed stocks but didn’t anticipate how significant its impact would be on the price. The past 50 years of historical oil prices, suggest we probably should have. Second, a few years back the price incentive needed to add additional oil resources was north of $100. We underestimated how malleable this number was. Kevin’s big lesson for the year is that, when the price falls, industry participants miraculously find a way to pump oil at half the boom-time cost. This dynamic is playing out across the whole commodities sector and means that much-needed supply curtailment is taking longer than expected and happening at much lower prices than previously envisaged. Those cost curves aren’t worth the paper they are drawn on. The final lesson from the oil patch relates to the specific risks of investing in businesses where the main determinant of value is something as volatile as the oil price. There’s a healthy debate going on at the moment about the value of one of Australia’s great businesses, ASX-listed Woolworths (ASX:WOW). The bulls think its dominant market position means 7% EBIT margins in Woolworths’ groceries division are sustainable. The bears think low cost competition will have the same impact it has had in the UK and drive margins down to 3-4%. That wouldn’t be a good outcome for shareholders, but it would still be a very profitable business. 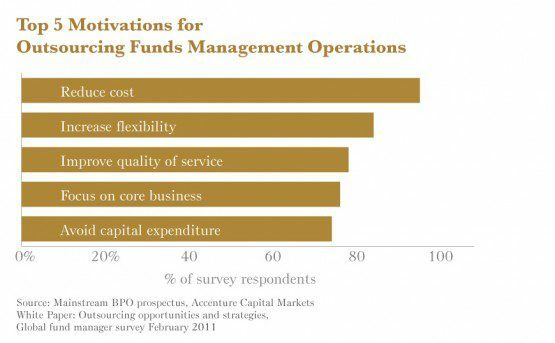 Contrast that range of potential outcomes with our oil services investments. They were nicely profitable a few years ago and are bleeding losses now, almost exclusively because of something completely outside of management’s control – the oil price. The degree of variability in these businesses is dramatic and the value of them is dependent on something which is largely unknowable. We should only be investing in them at times of outright pessimism and, even then, in very small portions. “Not much” is my answer when asked how much time we spend talking to management. Most people seem to think we should be doing a lot of it, but 2015 reiterated the dangers of getting too close to CEOs. Concerned about the company’s viability, we had a call with the management of oil service company Dolphin Geophysical in March 2015. The share price had already fallen roughly two thirds from its peak but we were worried about it going to zero given the state of the oil market at the time. Armed with the knowledge that the company has now filed for bankruptcy (fortunately we sold it a few months ago, but not before losing the vast majority of our investment), the notes from that call are laughable. Of course everything was going to be fine. Of course they had plenty of potential to cut costs. Of course their “asset light” business model would enable them to skilfully navigate the current market conditions. What did we expect? Were they ever going to tell us they were going bust? It is often more nuanced than this, and getting the most out of management meetings is all about reading between the lines. But they are always going to tell you what you want to hear, and more often than not you only want to hear what reinforces your pre-existing ideas. Management meetings can be a useful part of an investment process – particularly when you have already done a significant amount of research and are tying up loose ends – but they are a relatively small part of ours, and I expect it will stay that way. Forager is a small team of analysts competing with giants of the funds management world. Apart from loyal and long-term clients allowing us to make genuinely long-term investments, our most significant advantage is being able to invest in parts of the market where the competition can’t. This year has reiterated how successful that can be and you should expect an increasing percentage of the International Shares Fund to be invested in stocks like those mentioned above over the coming years. However, the stock was illiquid and the price had jumped 40% by January 2015 to around $7. Despite signs that the investment thesis was looking better than originally envisaged, we decided to wait for the price to fall. “Well it didn’t – today the share price is $22”. Value investors find it easy to ignore the pessimism when a stock is trading at or near its lows, but this same bent for a bargain sometimes stops us buying a stock simply because its price has risen. As Alvise puts it, “the lesson here is that the market can underreact to new positive information, just like it can overreact to new negative information”. We tend to be pretty good at factoring the new information in when we already own a stock. Over the past year we have added to our largest holdings in both portfolios as good news didn’t move the share price as much as it should have. We need to get better at doing the same for stocks we don’t yet own. The best investment ideas are very rarely immediately obvious. Except in times of extreme distress, we shouldn’t expect fellow investors to leave $100 notes lying around on the pavement. Looking back at our best investments from the past year, none of them would have looked cheap on the basis of superficial ratios (each of the successes mentioned above would have been trading at large multiples of both earnings and assets at the start of the year). We generally need an insight into the business or the opportunity that other investors haven’t had. Regarding Betfair, that was the competitive advantage and scalability of its business model. 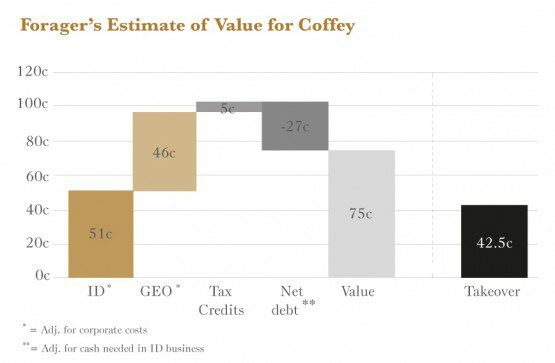 For Coffey, it was that one division was worth more than the entire value implied by the share price. These key insights might require a lot of work and some creative thinking but, once you have the insight, the idea itself should be very easy to explain. Simplicity is often a key indicator of a bargain. Take Kapsch TrafficCom for example. This Austrian tolling technology company has its complications. The company has two main divisions, one of which is lossmaking, and dozens of new business opportunities that haven’t yet been executed on. The idea was simple, though, because the share price was low enough to ignore the complexity. As Gareth puts it, “at a price of €20 per share, you were buying the whole business for less than the value of Kapsch’s reliable, predictable truck tolling division of the business”. If the rest turned out to be worth anything positive, “the stock would turn out to be a bargain”. At a higher price, you need to start putting a value on all of those options and that’s where the idea gets complicated. And generally, the more complicated an idea, the more things that can go wrong. Our investment in oil-services company Subsea 7 (OB:SUBC) was dependent on the oil price, the relative competitiveness of offshore oil versus other sources like shale, management execution and the political environment in Brazil. The more factors an idea is dependent on, the more there is that can go wrong. The media (and apparently some fund managers) is calling the 10 years to the end of 2015 the “lost decade” for Australian shares. At the time the article was written the decade’s return was a “miserly 5.4%”. First, that doesn’t include dividends. In a country where the tax system encourages particularly high payout ratios, dividends should and do represent the bulk of investor returns. Incorporating dividends, the total return has been a much more acceptable 68%. More importantly, though, it has been a great decade for stock pickers. We’ve had numerous market panics provide opportunities to invest widely and almost every year has provided enough volatility to find individual opportunities. The past year has been no exception. Kevin, talking about his biggest successes for the year, notes the Google (NASDAQ:GOOG) share price volatility as providing a great opportunity: “Continuing to follow Google after we had sold the stock enabled me to spot a change in its attitude towards capital allocation and costs”. But it was August’s mini meltdown that allowed us to execute on this rediscovered optimism. “Across two trading days in August, the share price of one of the world’s largest businesses traded between $565 and $640, allowing us to pick up shares for $585 each”. Now called Alphabet, today it trades at around $775 per share. There have been hundreds of episodes of market madness that have made the past decade a great one in which to be an active investor. As long as we keep building on our list of investable opportunities, I have no doubt that the coming decade will offer up the same. Forager is a small team of analysts competing with giants of the funds management world. Apart from loyal and long-term clients allowing us to make genuinely long-term investments, our most significant competitive advantage is being able to invest in parts of the market where the competition can't. The big miners and banks have been the main drivers of ASX market returns for more than a decade. That came to a dramatic end in 2015. To give an idea of the magnitude of the declines, shares in miner BHP Billiton (ASX:BHP) fell 39% during the year, knocking $60 billion Australian dollars off its market capitalisation. Shares in peer Rio Tinto (ASX:RIO) fell 23%, shedding $24 billion of value. 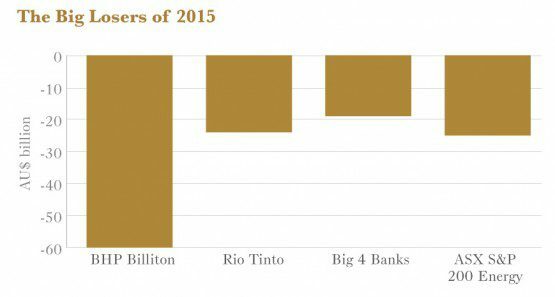 The four big banks lost a further $19bn in appraised value, and if you throw in another $25bn, or 31%, lost by the ASX 200 Energy Index thanks to a collapsing oil price, a total of $128bn has been wiped from the big end of town. That’s more than 8% of the $1.5 trillion ASX All Ordinaries Index, a significant movement to say the least. And for boutique fund managers, like Forager, who tend to ply their share picking skills in smaller industrial companies, it has been a boon to relative returns not to be invested in this part of the market. In our case it was a deliberate decision to invest elsewhere. And the Australian Shares Fund has suffered in previous years against a benchmark propelled by the appreciation of these blue chip companies. It does show how arbitrary short-term performance comparisons are, and how difficult it is to distinguish between skill and luck in investing. But it does show how arbitrary short-term performance comparisons are, and how difficult it actually is to distinguish between skill and luck in investing. To quote Daniel Kahneman, whose studies found virtually zero correlation in the returns of practitioners in the investment industry from year to year, “the illusion of skill is not only an individual aberration, it is deeply ingrained in the culture of the industry”. That’s even more the case in Australia where the index is dominated by a small number of large companies. So don’t give too much credence to fund managers, including us, reporting nice relative performance for the past 12 months. Anyone who doesn’t own the index is doing well. A new company, MainstreamBPO (ASX:MAI), was added to the Australian Shares Fund portfolio in late 2015. The shares were bought through an initial public offering, which is something we tend to avoid. But a few factors swayed us to participate here. Firstly, the sellers were founders rather than private equity. Secondly, the money raised is being used within the business rather than cashing the vendors out. Thirdly, the opportunity was enticing and, due to the company’s small size, it was the only way to buy a meaningful amount of shares. Mainstream provides administration services to the funds management and superannuation industries, helping to take care of day to day activities such as unit pricing, investor communication, and the processing of investor applications and redemptions. The role that Fundhost performs for our funds, Mainstream performs for other funds management companies, including industry giant Magellan Financial Group (ASX:MFG). It has also branched out into compliance, performance reporting, and call centre services. This isn’t the world’s most exciting business but Mainstream takes care of the fiddly little tasks that clients don’t want to worry about. It can be a good business, with reliable revenues and reasonable margins. Importantly, Mainstream has some scale in a business where size matters. Being large delivers big cost savings in this line of work as it allows greater fixed investment in automation and technology, which lower costs and improves service. There is therefore a strong incentive for clients to outsource (that’s the ‘O’ in ‘BPO’) administration services rather than do it themselves. Yet, despite the compelling reasons to do so, the industry has been painfully slow to embrace progress. Much work is performed manually that could be automated, and the service provided to investors is often less than what it could be. Many fund management businesses still perform administration in-house, or have outsourced to subscale businesses running outdated software or operating from spreadsheets. That’s partly because of switching costs, the effort and risk involved in changing administration providers, but also from lethargy. The trend is increasingly towards outsourcing, though, as technology pervasively improves and investors demand better service. This, and potential consolidation among service providers, presents good growth opportunities for Mainstream at high incremental returns. The business isn’t bullet-proof. 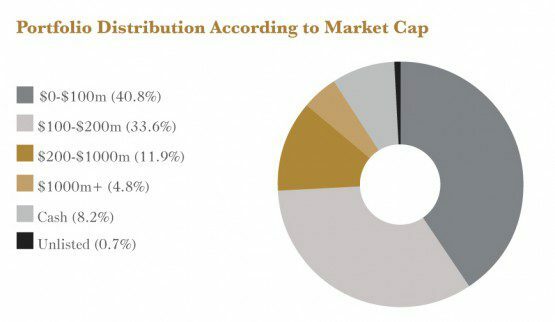 Mainstream’s top two clients account for 36% of revenue, which is a little uncomfortable, and there’s also the risk that a sharemarket crash could see many of its fund manager clients become unviable. Still, on balance, it’s a better business model than most we see. The Fund’s shares were purchased at $0.40, equating to roughly 10 times forecast operating profit before tax. Though it pays to be wary of prospectus forecasts, and we’ll be more confident if the forecast results are achieved, that’s a nice price for a stable business with potential. The share price has since jumped 48% to $0.59, closer to our estimate of fair value, but liquidity is limited so we’ll be holding this investment until it becomes more mature and more shares trade. The trend to outsourcing, and potential consolidation among service providers, presents good growth opportunities for mainstream at high incremental returns. If you need convincing that executives only ever give you an extremely biased narrative about a company’s prospects, just wait for a board sanctioned takeover offer. We have been concerned about Coffey International’s (ASX:COF) debt levels since we first bought the stock in June 2014. At meetings prior and subsequent to our investment, both CFO Urs Meyerhans and Managing Director John Douglas were adamant that the relationship with lenders was rock solid and that there was nothing to worry about. The most recent of these meetings was in August 2015. It’s amazing how much can change in less than six months. Apparently, were we not to accept a takeover offer from US company Tetra Tech (Nasdaq:TTEK), the Coffey’s “overgeared” balance sheet would leave it in a “precarious position”. The truth, of course, is that nothing much has changed. Meyerhans and Douglas changed their tune because they wanted us to accept the bid (sweetened for them thanks to 4.2 million “performance” rights they received at the 2015 AGM, two days after the bid was announced). Coffey has too much debt, but that is a fixable problem, not a reason for selling the business on the cheap. Despite the offer price of $0.425 being a huge premium to where Coffey was trading prior to the offer, our view is that the business is worth more. With the Australian dollar buying just 70 US cents, the value of Coffey’s International Development business alone justified the bid price and the deal didn’t include any value for its significant franking credit balance. Unfortunately, other shareholders didn’t share our view and we were too slow out of the blocks in convincing them otherwise. Tetra Tech had received acceptances equating to 80% of the register prior to Christmas and, faced with the prospect of a prolonged and drawn out stalemate, we decided to throw the towel in and accept the offer. 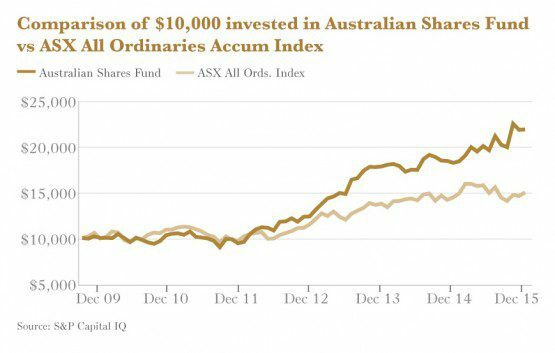 With an average purchase price in the low twenties, the investment has been a good one for the Australian Shares Fund and contributed meaningfully to an excellent year in 2015. That shareholders left too much on the table is a slight sour note in the encore. On a side note, the lack of consideration given to franking credits in takeover bids has been an extremely frustrating theme throughout 2015. Both Vision Eye Institute and Coffey handed huge piles of franking credits to international acquirers who have much less use for them than we do. Boards make two big mistakes. They assume only a certain percentage of their shareholder base will value them, when we know from past experience that everyone benefits when franking credits are part of the deal. The shares simply trade from shareholders who don’t value them to new ones at a price that benefits both parties. And, while a typical incentive fee for advisors depends on the price shareholders receive for their shares, boards never include franking credits in that number. Investment bankers want to maximise profit and minimise effort. If they aren’t getting paid for it, the chance of them working hard to a find a solution that includes franking credits is zero. Give them a share of the spoils and we are much more likely to get the right result. Hopefully 2016 sees a more enlightened approach. We’ll finish up this report talking about parking, which is perhaps the only thing less interesting than fund administration. The company of interest, Smart Parking (ASX:SPZ), develops hardware sensors and software applications that allow drivers to find vacant parking spaces and pay fees using their mobile phones. As people fiddling around with loose change could attest, car park management, like fund administration (last reference to it I promise), is stuck in the dark ages, so it should be a promising business. But getting customers – usually local councils – to sign contracts is a painfully slow process. Smart Parking has London’s Westminster council on board and a significant number of high profile trials under way, but this part of the business is only bringing in $4m of revenue at the moment and losing money. There’s value in the technology, but it’s hard to be sure how much. Smart Parking has another source of value, however, in a managed services segment which operates car parks on behalf of landlords, often large supermarket chains. This segment, bought in 2011, was previously called Town & City Parking and operates in the United Kingdom. It was a disastrous acquisition (Smart Parking subsequently led law suits against the vendors for mismanagement and poor disclosure surrounding the state of the business at purchase). But management is intent on fixing this segment and seems to be making progress. With some $20m of revenue it should be able to generate enough profit to fund expansion on the technology side of the business. We made an investment in Smart Parking in 2014, at an average purchase price of $0.15 per share. At the time we thought the $43m market capitalisation was almost justified by the stable parking management business and that the parking technology business was an interesting option for the future. Progress has been slower than anticipated but a few meaningful contract wins and dramatic improvement in profitability over the past six months has rocketed the company’s share price to $0.245 at the end of December. It’s a very small position and will remain small given the speculative nature of the business, but Smart Parking looks to have turned a corner. We’re thankful that this past year went better than the one before it. But we continue to focus on process, confident that it’s the path to good long-term outcomes. This year, Forager stopped providing commentary on short term performance, although you’ll find those details in the table below. As long term investors, months are largely useless and even one-year performance figures risks confusing skill and luck. But let’s not pretend—we’re relieved that this year went better than last. 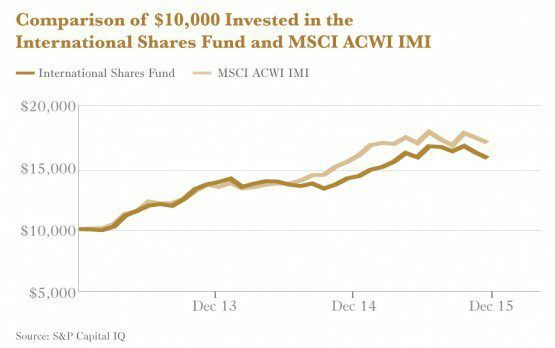 And we’re more confident than ever that in this big, wide world there are profitable niches for the Fund to exploit. Our team turned over a lot of rocks this past quarter. We had a quick look at a significant percentage of all listed stocks in the UK and Canada. We combed through hundreds of companies around the world that spend a high percentage of revenue on marketing (an area where we might have an edge). We took a more detailed look at companies in industries from aerospace to diamond mines, from specialist software to kitchenware to lasers. The portfolio doesn’t look dramatically different from 3 months ago—a few new small stakes in smaller Asian stocks, an investment in an as-yet-unnamed Italian industrial company, a modest new position in a US blue chip (see eBay below) which ran up before we could load up and a few older holdings topped up on weakness. In the short run, progress isn’t always linked to how hard you paddle. But good process tends towards good outcomes, and on that note we had a respectable quarter and year. The next bargain is out there, just waiting to be identified. The big difference between today’s portfolio and that of 12 months ago is the two companies vying for the title of largest holding. For the first few years of the Fund’s life, the biggest investments were global giants like American Express (NYSE:AXP) and American International Group (NYSE:AIG). 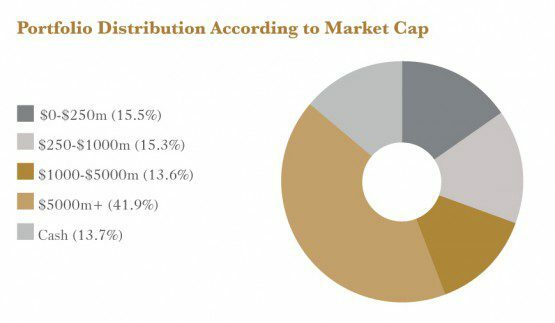 Today the two largest holdings – each roughly 6% of the portfolio – have market capitalisations of less than $1 billion. One of them, Kapsch TrafficCom (WBAG:KTCG), we have written about in some detail. The other, even smaller and with less liquidity in its shares, we have been keeping quiet about while we built a position. With a recent run up in the share price and a full portfolio weighting, we are now prepared to talk about the Fund’s holding in Lotto24 (DB:LO24). The company sells online tickets in established, government-sanctioned lotteries. It is a business model perhaps familiar to investors in the Forager Australian Shares Fund where we own a meaningful stake in Australian equivalent Jumbo Interactive (ASX:JIN). Indeed, the investments are not coincidences. We first heard of Lotto24 a few years ago when discussing global expansion plans with Jumbo’s Managing Director Mike Verveka. Verveka explained that their plan was to be number two or three in the newly opened German market. When asked what was wrong with number one, Verveka told us that one competitor already had a headstart and was impossible to supplant. That competitor turned out to be a company listed on the German stock exchange, Lotto24. Better still, by the time we stumbled across it, the share price had fallen some 40% from its peak and implied a valuation that we thought was a steal. Experience isn’t something we will often cite as a source of competitive advantage, but it is the main explanation for Lotto24’s success (both historical and implied in our valuation). The company’s former parent, Tipp24, built an extremely successful online lotteries business in just six years from 2003. By the end of 2008, when the business was scuppered by regulators, it had built a database of 2.4m German customers and generated €46m of revenue in the prior year. The authorities discovered that not having private online sellers of their lotteries was hindering rather than helping revenue generation and decided to allow them back into the market in 2012. That’s when Jumbo decided to apply for marketing licences, and when Tipp24 decided it would start again, with a newly listed spinoff Lotto24. Not surprisingly, the same team is getting almost exactly the same results. Lotto24 is acquiring more customers every month than Jumbo has acquired in the entire time it has been operating in the country. At the end of the most recent quarter, Lotto24 had 827,000 customers, an increase of almost 400,000 in the previous 12 months. It is the only private operator of any scale and, now that it has the ability to outspend everyone else, it is highly likely it will stay that way. over the past 12 months, we are confident this business is worth a substantial premium to the current share price. Unlike Jumbo, which is even cheaper relative to its value, we are also confident that Lotto24’s management team will ensure that the value ends up in shareholders’ pockets. Last month, we highlighted problems besetting recent investment Rolls Royce Holdings plc (LSE:RR)—exposure to struggling oil and gas markets, a business jets operation which is in decline and a bloated cost structure—all leading to five profit warnings in 18 months. Fantastic! So why did you idiots buy it? The company’s gem is its commercial aviation business, which sells engines for widebody aeroplanes. It’s a duopoly business— if you board any aeroplane with two aisles, that plane will be powered by engines from either General Electric (NYSE:GE) or Rolls Royce. Rolls is currently the smaller of the two. But it’s got the jump over GE on the next generation of engines, thanks largely to two particular engines. The Trent 1000 is Rolls Royce’s offering for the Boeing 787 Dreamliner and has been selling well. More importantly, the company has spent a decade developing various sizes of Trent XWB engine, which power the fuel-efficient Airbus A350. This aeroplane, which went into first commercial operation earlier this year, has a massive order book stretching out a decade. Within a few years, Rolls will be the largest widebody engine maker. If you’ve been at it for a while, you might have a concept known as the ‘Gillette model’ in your investing toolkit. Gillette sells razors at breakeven, happy to lock in your future blade purchases from which it profits handsomely. The commercial engine market works similarly. The accounting is too complex to outline here, but Rolls Royce sells its engines at an underlying economic loss. Over the ensuing life of that engine, though, it makes approximately 3-4 times as much in revenue from parts and service as it does from the original sale. And that ‘aftermarket’ revenue has historically been very profitable. The upside case for Rolls is simple. The chart above highlights the impact of its massive order book of future sales, chiefly for engine variants for the Airbus A350 and Boeing 787. 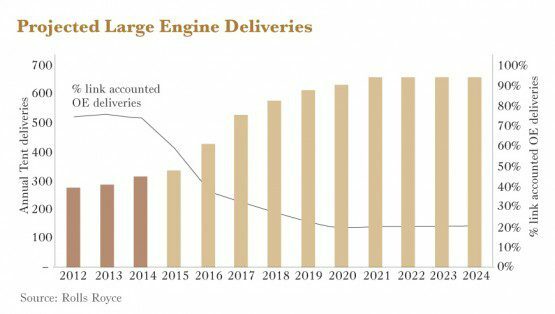 The company’s annual production of large engines will more than double over the next five years. These engines will generate locked-in aftermarket business for decades. 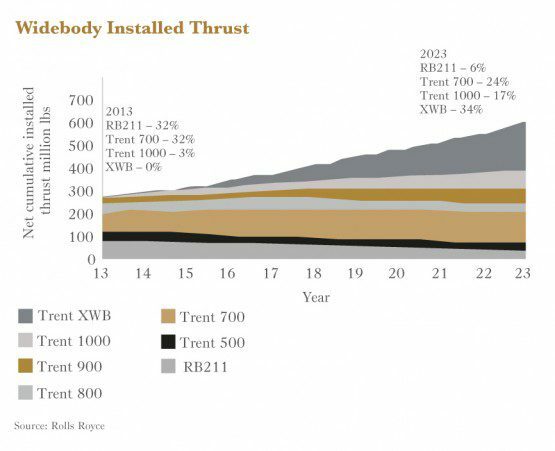 The chart below highlights the impact on the installed thrust base of Rolls Royce engines, which is a very good proxy for annual aftermarket revenues. In 7 or 8 years, revenues will almost double in real (after inflation) terms, and continue growing more modestly thereafter. The potential is massive. But with a few strong headwinds in other areas of the business and a renewed focus on the company’s bumbling bureaucracy, the market is wondering whether Rolls could stuff it up even from this privileged position. It’s not inconceivable. That’s partly why we’ve kept the position size a modest 3.5% of the portfolio. But we like the company’s new CEO, Warren East, who has an engineering pedigree and a track record of cost-consciousness in his last role, the spectacular turnaround of ARM Holdings (LSE:ARM) in the microprocessor systems industry. He’s got a mammoth job ahead of him but the upside is significant. He’s already started trimming, and there’s a lot more fat to cut. We should know whether he’s on the right track 2-3 years from now. If he gets it right, less than 10 years from now Rolls Royce will be generating cash by the planeload, and we won’t regret having held the stock through this period of turbulence. Investing is an activity behavioural scientists categorise as a “difficult learning environment“. An easy learning environment is one where you get regular feedback and that feedback enables you to improve your process. If you bowl a cricket ball at the stumps and miss by a foot to the left, aim further to the right and try again. Repeat the process over and over and you will eventually become accurate. Investors get a lot of feedback in the form of daily share prices but that isn’t necessarily related to the original analysis and decision making process. Rolls Royce’s share price has fallen, but it is far too early to tell whether that means it is a better opportunity today or the original decision was wrong. Every now and then, however, you get clear evidence one way or the other. And nothing is clearer than a business going bust. Norwegian oil services business Dolphin Geophysical (DOLP:OB) filed for bankruptcy in December. We had already sold the Fund’s shares a few months earlier, but it had previously been a significant and very costly investment. The company filing for bankruptcy is confirmation that we blundered. Having talked the plummetting oil price to death and included it in our lessons from 2015, we won’t rehash the macroeconomic backdrop here. Suffice to say that our original valuation was dependent on the oil price staying at historically high prices. We thought we had valid rationale for that view. We were wrong. We do have other investments in the space that haven’t faired nearly as badly, however. Dolphin’s specific problems included too much debt and too much operational leverage, a toxic combination in a cyclical industry. Managment trumpeted the “asset light” business model but, as we often see in the retail space, long-term lease liabilities can also be a noose around a company’s neck. Dolphin may not have owned the boats it used to conduct seismic surveys, but it had committed to paying for them for a long time. While the balance sheet may look more worrying, owning assets, with a conservative amount of debt used to finance them, is a more robust business model than non-cancellable long-term leases. So Dolphin joins Enero Group (a disastrous early investment in the Australian Fund) in the Forager Hall of Shame. We won’t beat ourselves up too much. Mistakes are part and parcel of investing and it’s the average that counts. Indeed, despite Dolphin and other oil-related losses, the past year has been a relatively good one for the Fund. 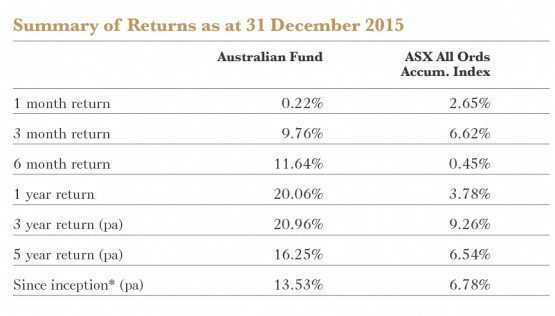 As the past years’ results in the Australian Fund show, however, avoiding these errors is the key to exceptional rather than average returns. We’re not experts at technology. Many sectors within the industry are far too specialised and unpredictable for our liking. But you don’t need to be a technological genius to see the wide and deep moat surrounding some established technology businesses. US companies Sabre Corporation (Nasdaq:SABR) and eBay Inc. (Nasdaq:EBAY) are two examples, both 2015 additions to the Fund. You probably won’t know Sabre, but odds are you have utilised its services. The company is a leader in travel-related software, supplying much of the IT infrastructure that allows airlines and hotel chains to carry out day-to-day operations. Check-in to a Virgin Australia flight on your mobile phone and you will notice you are using the Sabre platform rather than Virgin’s technology. Sabre also operates one of the largest platforms that facilitates bookings for travel agents. Think of it as an online marketplace where travel agents get immediate access to products including flights, hotel rooms and rental cars. The platform is plugged directly into almost every travel supplier’s system (airlines, hotel chains, etc), so the data is comprehensive and any schedule changes are updated immediately. The platform handles ticketing, invoicing, and payment among other services. For the travel agent, this is the lifeblood of their business. Over the years, Sabre has developed deep ties with customers and acquired a strong share of the market, resulting in enviable profit margins. It is relatively new as a public company, and its story is not well understood by the market. While 2015 has been a positive year for the business, 2016 should be a real standout as a number of new large contracts begin. It’s a high quality business with a significant growth opportunity. eBay will be a name more familiar to investors. It’s something of an elder statesman within the technology industry, but we think it has a new lease on life. Recently separated from online payment platform Paypal, eBay is charting a new, independent path that should improve operational focus and financial performance. When tethered to Paypal, insufficient strategic focus was placed on its ability to compete effectively with ecommerce peers like Amazon. We think that is changing and there is a huge reward if it is successful. The company also owns some of the best online classifieds businesses in the world (including Gumtree) which provide an underappreciated source of value. With a fresh spotlight now upon them, we believe the public markets will eventually appreciate eBay as we do. Over the years, Sabre has developed deep ties with customers and acquired a strong share of the market, resulting in enviable profit margins. It is relatively new as a public company, and its story is not well understood by the market.